Dog Whistles: When Reagan came to Philadelphia in 1980, the town’s past never came up.Jackson, Mississippi—We spent eight hours yesterday at the Neshoba County Fair in Philadelphia, known to locals as “Mississippi’s Giant Houseparty” (that’s a registered trademark), and to outsiders as the place where Ronald Reagan kicked off his presidential campaign in 1980 without once mentioning the three civil rights workers whose bodies were found outside of town in 1965. If Reagan couldn’t talk about Philadelphia, Philadelphia at least can’t stop talking about Reagan. “You know, Ronald Reagan came here in ’81 or ’80, I can’t remember,” one woman tells me. I get this a lot. On stage during the day’s political festivities, the succession of candidates hold onto their little slice of history with both hands. “I am proud and humbled to be standing on the podium where Ronald Reagan once stood,” declares Wally Pang, a self-described Tea Partier who’s running for Congress as an Independent. “Ronald Reagan began his campaign for the presidency right here in these fairgrounds!,” notes Vernon Cotton, incumbent circuit court judge for Mississippi’s eighth district. 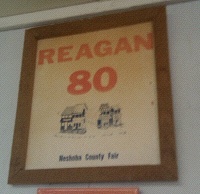 Reagan’s name comes up, sooner or later, in pretty much every conversation I have at the fair. I’ll cover the rest of the fair in another post (or two, or three—it was pretty wild), but for now, here are two quick thoughts on the town’s past from fairgoers old enough to remember. Martha Cummings, 77, grew up in town and now lives in southwest Georgia, but she still makes the trek into Philadelphia every year to stay in her family’s cabin. She’s been going to the fair since she was a little girl; it’s where she went on her first date (it didn’t last). After college, Martha left town and moved to Woodlawn, on Chicago’s South Side, while her husband was in law school at the University of Chicago. “I had a lot more of a drawl then than I do now,” she says. She still has a drawl. Then she volunteers another story, from her year on Chicago’s South Side in 1955: “My husband needed some work on his car and went into a shop. That was after they’d found this young boy from Chicago who’d gone down to Mississippi and been killed [Emmett Till]. And it was one of those garages with those doors that open up and then come back down, and he drove in and it was all black guys. And they saw his Mississippi plates and asked, ‘are you from Mississippi?’ And in his New Jersey brogue he said, ‘Yes I am.’ And they treated him just fine.” Fixed his car, too. Rodney Fulton’s story is somewhat similar. A retired schoolteacher (business and typing, mostly), he’s sitting on his front porch, watching the horse races, when I bring up the murders.